Every company bears effects on the personality of a person. It is the very nature of human being that he adopts the culture, traditions, behaviours, attitude, thoughts etc. of the society where he lives. Even, his ascent becomes similar to the people around him. It is a famous saying, “A man is known by the company he keeps.” Good personality is a testimony of good company. It is sign that he interacts with noble people. Likewise, undesirable behaviour speaks of immoral company. Hence, the one who is committed to become a gentleman, he must join the company of such people. Only wine drinking, gambling, adultery etc are not evils but it includes malice, grudge, lie, backbiting, greed, pretence etc too. Similarly, righteousness is not confined within boundaries of sharia rather it consists of sharia and mysticism. It implies that a man must be a manifestation of virtuosity exoterically by following sharia as well as esoterically by adhering to mysticism. Simply, one’s inward should be free of grudge, malice, jealousy, ignorance, greed, lust, everlasting hopes etc. Such an inward becomes the possessor of light. It was just because of marvellous beneficence of company of Prophet Mohammad that all the Companions were not only regular in prayers, fasting and rest of the devotions but they had disclosed the esoteric reality of these devotions. The beneficence was so explicit and perfect that the Companions were entitled as stars because star serves as a guide to traveller during night. In the same way, they are guide of umma. Then Tabi‘un (successors of Companions) were benefitted by the company of Companions. Tābi’ al-Tābi’in got the blessing from the enlightened company of Tabi’un. This chain continued, thus common people got this beneficence from company of Saints. Tradition of getting beneficence started from all eternity and it will remain continued to all eternity. It has such an importance that Allah has instructed to adopt virtuous company. Whenever Quran instructs to adopt good company, it also warns against evil company. One should chose the company which is token to success in this world and the hereafter. The company which sanctifies innerself from impurities, thus one becomes manifestation of light. Undoubtedly, it is the company of Fakirs, which encompasses the above-mentioned beneficences. It is obligatory for the seeker of Allah to search such a company which is source of perfection of faith. Although there is no Prophet after Prophet Mohammad but now seekers of Allah gain closeness of Allah and His vision through the mediation of Fakirs. Therefore, there are a number of Hadiths which emphasises to join the company of Fakirs. In fact, good companion symbolizes Saints and Fakirs, and perfume denotes faith. On the other hand, companion blowing bellows is like the one who astray and ultimately one becomes the fuel of hell. 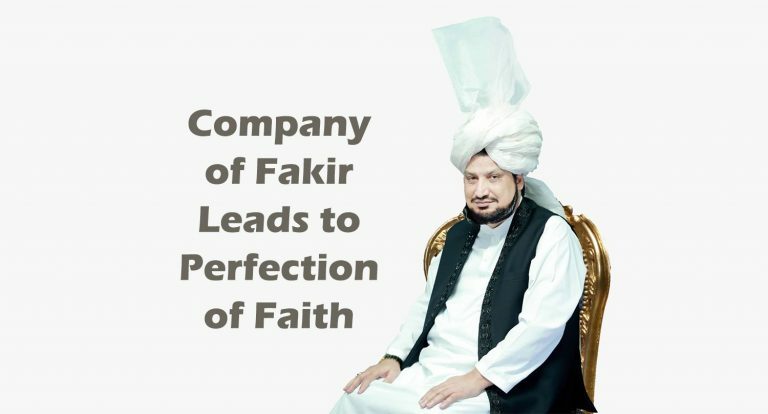 Company of Fakir is the most authentic and only way to gain vision of Allah and perfection of faith, provided one joins their companionship for seeking Allah instead of materialistic world. Abdullah ibn Abbas narrates once someone asked Prophet Mohammad: Who is a best friend? Quran is a comprehensive book which is applicable to the eras until Day of Judgement. Therefore, above-mentioned verse implies that there will be a group of people who will always invite people towards gnosis of Allah. Previously, such an invitation was responsibility of Messenger and Prophets but after Prophet Mohammad, it has been assigned their successors i.e. Fakirs. Umar ibn Khattab relates that Prophet Mohammad said: There are some slaves of Allah who are neither Prophets nor martyred, but on the Day of Judgement Prophets and martyred will wish for status equal to them. Companions asked about those people. Prophet Mohammad replied: They are the ones who love each other for Allah only although they are not relatives or business partners. I swear! Their faces will be enlightened, they will be sitting on high chairs made of light. Neither they will be fearful nor sad, whereas rest of the people will be depressed. In this era, when the world is replete with evil, everyone, specially youth, must join the company of perfect Saints. In fact, Satan leads people astray in their youth because innerself is more disobedient in this age. Perfect Fakirs (Fuqara e Kamileen) purify the innerself of a person with their momentary spiritual glance. Perfect Saints (Auliya) are like mirror which reflects the weaknesses of beholder. Subsequently, getting rid of these weaknesses lead to success in this world and the hereafter. The company of Fakir is like to person who has built his home on the bank of ocean of fragrance. Such a home remains scented no matter windows and doors are closed. On the other hand, the company of strayed people is like a coal-mine. Therefore, it blackens everything esoterically and exoterically. Ibn Hamza (ra) says: Before performing devotions and mystical exercises seek guidance from perfect Mystic. Ibn Qayyim al-Jawziyya says: Stand with those Fakirs firmly who are engrossed in invocation of Ism-e-Allah Zaat, follow the Sunna strictly and careful in all of their matter (for the fear of Allah). Explanation: Seeker of Allah should find a Fakir whose countenance reminds him of Allah and unites him with Allah. He purifies the innerself of a seeker for Allah and he has authority over stations of certainty (knowledge of certainty, eye of certainty and truth of certainty). Shaikh Mohammad ibn Yusuf explains these verses in his books Nur-e-Mobeen Ali Al-Murshid al-Mu’een: The sacred company and countenance of a perfect Saint is a source of remembering Allah. He takes the slave to Allah by blessing him the cognizance of his weaknesses of innerself and persuade him to reject everything other than Allah. Perfect Fakir (Fakir-e-Kamil) points out all those weaknesses of seeker which are hurdles in the way of Allah and subsequently he recommend the medicine for it as well. Shaikh Husayn bin Abdullah bin Mohammad Tayyabi says: The person who is sick with esoteric aliments, he should search for a perfect Fakir (Wali-e-Kamil) as he is the only doctor to cure them. Abu Ḥamid Mohammad ibn Mohammad al-Ghazali says: It is obligatory for everyone to join the company of Mystics as there is no one purified from esoteric diseases other than Prophet. Al-Ghazali further says: Those who believe that they do not need guidance, they are like self-growing plan which dies early. Shaikh Abdul Wahab Shirani advises Muslim: Join the company of the one who has adorn the throne of persuasion and guidance so that he engross you in invocation of Ism-e-Allah Zaat to the extent that you achieve salvation from satanic whisper even in your devotions. Shaikh Aki Khawaz says: Do not walk on this path without guide, otherwise you will be lost in stations and difficulties coming in this way. Friendship of a Fakir is the treasure of faith whereas the friendship of imperfect and seeker of materialistic world creates distance between Allah and his slave by abolishing the faith. Such a friendship leaves one alone in a thick forest helpless, hence he becomes the slave of innerself and hypocrite, thus becomes accursed. In addition, he misguides other people. Wherever someone suffers from any disease, he get his check up done from a best doctor for cure. Therefore, he follow the prescription and take every medicine advised by doctor without considering the pain he experiences. Similarly, the one who desires to attain the perfection of faith by getting rid of esoteric diseases, he must join the company of perfect Fakir. This is the only way to be successful in the purpose of life. Remember! Man gets what he seeks. Some accursed people tag the friendship of Fakir as extinction of faith. In fact, their gamut of faith is limited to physical devotion. In reality, their physical devotion have made them ignorant. Their ignorance is visible in their discussion and gait. Moreover, they nominate people for paradise and hell as Allah has given them authority over it. Although, they are sick of jealousy, grudge, pretence, narcissism and lust. In fact, they have become enemy of Fakirs because of these esoteric diseases. In this era, Tehreek-Dawat-e-Faqr is the true representative of teachings of Prophet Mohammad. Sultan-ul-Ashiqeen Sultan Mohammad Najib-ur-Rehman is the founder of Tehreek-Dawat-e-Faqr. He is perfect spiritual guide who possesses the light of guidance. In this era of sectarianism, his teachings are the only guidance. His company grants salvation from satanic whisper. It is an open invitation to visit him to all those who believes that there is no spiritual guide in this era. Those who denies the grand status of Saints, they must pay visit to Sultan-ul-Ashiqeen and seek Ism-e-Allah Zaat. They will start believing soon after experiencing the closeness of Allah. Thus, Allah will disclose the reality of His Saints upon them and provide refuge to them against Satan. May Allah bless us with wisdom to understand the grandeur of their company and their exalted status and save us from blasphemy. Do leave a comment or query as we would like to hear from you and for support hit the like button.